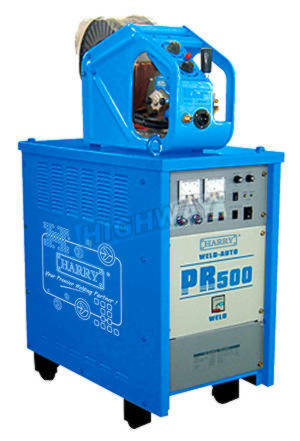 Harry PR-500 Interver MIG Wire Feed Welder, Stock available at Highway Marketing Sdn. Bhd, Sibu, Sarawak, Highway Marketing Sdn. Bhd. Bintulu Branch, Highway Marketing Sdn. Bhd. Miri Branch, Highway Marketing Sdn. Bhd., Kota Kinabalu Branch, Sabah, Malaysia. • Increased arc flocking function and steady in arc transition. • Trolley equipped for easy relocation. • Progressive easy operation and energy saving design. • Compact, reliable with over load protecting design. • Flexible out-wire feeder system design.